There are times in my life when I’ve returned to a wonderful place in the world that I’m still getting to know, and by chance, I’ve end up camping in the same field or returning to the same hostel. Only when I walked into the place, do I remember having stayed there before. Richard Cari’s home and the Kantuta Lodge is one of those places. Since I’m on the subject of “chance travel”, the reader might be interested my entry on a similar instance where I was hitch hiking across France and ended up sleeping in the same field I had slept in 15 years prior. 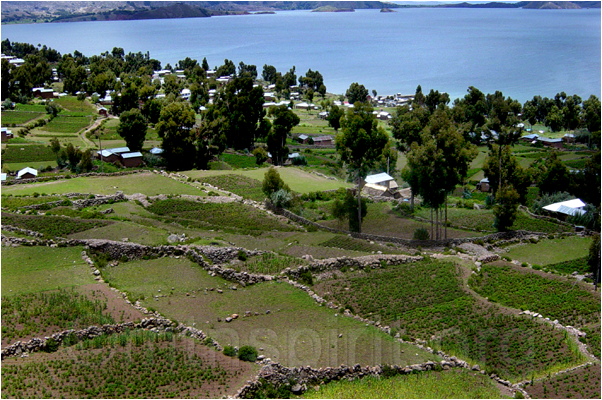 But for now, more on Amantani Island on Lake Titicaca. I’d come to Amantani Island a few times during my travels in Peru. The place and people drew me in. No cars, electricity only a few hours a day, not even cats or dogs, which made the place seem peaceful. There is hardship on Amantani. 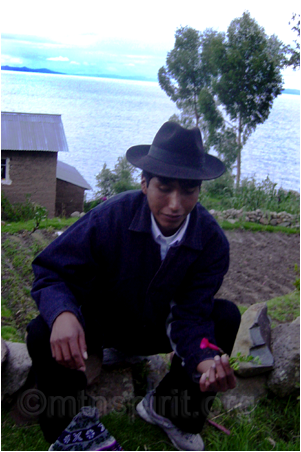 The small population living on the 3 mile by 1.5 mile island on Lake Titicaca live at 13000 feet in stunning but somewhat harsh environment. There sustainable crops of Quinoa, potatoes and herbs are rain dependent. There is no irrigation of the crops. People do go hungry, despite the tourism dollars that trickle in from visitors taking boats from the nearby (4 hours!) harbor or Puno, Peru. Most visitors stay at family homes on the island’s west side, who have formed a cooperative rotating schedule that spreads the wealth and visitor’s dollars so no one family is reaping the homestays. At Outward Bound we learned as instructors the metaphors of community, and here on Amantani, the population, because of its environment is a clear example of community. The island people work together with the resources they have to create the best possible outcome for all. Segundino, the island’s vice-Shaman, if you will, and his wife Marcelina have what was once a small home like the other villagers near the boat docks. But their son Richard went to University in Puno and majored in Tourism. He has come back with a plethora of “tools” and ideas he learned at school, that have transformed their home into the Kantuta Lodge, complete a separate building dining room, with longer beds for Gringos and Gringas and the only hot shower on the island. Richard has done a spectacular job with his new skills making a better life for his family. He is creating a market. I told him I would submit the family lodge Lonely Planet, and even though I’ve not followed through I suspect the word has already gotten out about his good work. The last time I visited Family Cari, I enjoyed the stay thoroughly. I got to help Richard’s sister Wilma do some cooking and plant potatoes by digging trenches in the garden below the house. I didn’t do very well by the way. Wilma, showing me the digging technique with a short handled hoe, giggled as I’d dig for a few feet before feeling breathless from the altitude. Her mother and father looked on from the house with a wry smile. The island community has a wonderful artisan’s center where stunning home-spun works are for sale, but they don’t take credit cards. In the image to the right, Marcelina is shown doing a traditional back-strap weaving on a loom staked into the ground with metal pins, which provide the tension on the fabric. On our next visit, with a group from the Northeastern US, this July, we’ll get a chance to explore much on Amantani with Family Cari. We also look forward to doing a service project with the guidance of the Cari’s. During my last visit, I had a chance to visit again with David Mamani and his family on the island’s east side, where tourism is not such a viable option because of its remoteness. David and Marcelina are brother and sister, which I didn’t know until my third visit on the island. Anyway, David and his family were interested in having a boat go around to their village on the east in order to drop tourists off for family stays as well. Our next village will see how things have progressed. 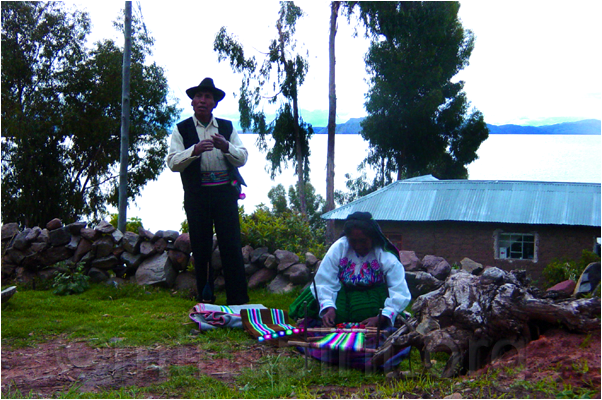 One notable feature of Amantani Island are the Male and Female spiritual ceremonial centers on the islands two summits, where the island’s Elders (Segundino Cari) conduct annual ceremonies in the old ways. Segundino and I had some long conversations about the indigenous view of the world and how Amantanians cosmology shapes their lives. We look forward conversing and experiencing more on this when we visit in July. More on the two summit ceremonial areas in another entry. You’ll see more entries about Amantani when we head there in July. If you would like more information on Amantani or our visits with Richard and his extended family drop me an email. This entry was posted on 15/05/2009 at 00:05 and is filed under Environment, Experiential Education, Focus on MSI People, Holistic Living, Leadership, Mountain People, MSI News, Peru, South America, Sustainable Living/Communities, Traveling. You can follow any responses to this entry through the RSS 2.0 feed. You can leave a response, or trackback from your own site. Although I’m heading back to Amantani this week, and will be assessing the health of the island economy further, I’m not quite ready to write an updated article on Amantani Island until I’m back from the island. There are some trends on the island that, with your help as a visitor, can be proactively course corrected by spreading out the tourism spending. Please stand by for our recommendations. I visited Amantani only 3 weeks ago. We had a wonderful homestay with a beautiful family. I would very much like to get in touch with this family. My comment is that I think that it is very sad if they have too much tourism here, as it might in some time destroy this fantastic community. It is wonderful that so many can visit them, but they have something unique there, wich it is sad to see dissapear. I would appreciate to see your views after having visited around the same time we were there. I’m curious where you would have stayed. If you’re trying to get a hold of the family, I can probably give you a friend or neighbor’s email there, who could then relay your email by printing it out in Puno and dropping it by your family’s home.